Although oceanography is the scientific study of the ocean, the subdiscipline of physical oceanography is principally concerned with the study of the structure and movement of water in the oceans. Physical oceanographic studies utilize a number of scientific specialties, and studies can encompass a diversity of technologies—from echo-sounding determinations of seafloor structure and seismic studies of movements in oceanic crust to satellite estimations of current flow based on radar reflections and thermal imaging. Physical oceanography studies the many factors that influence the movement of ocean waters. Wind can push surface water, and the gravity fields of the Sun and Moon continually exert gravitational tugs that push and pull massive amounts of water in tidal cycles. Earth's rotation also contributes to the physical movement of water, as do density and temperature differences between oceans or between layers of water within the same ocean. 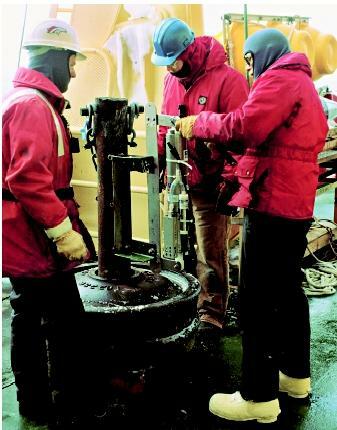 These physical oceanographers studying the Ross Sea in Antarctica derived a makeshift depth profiler by mounting a recording conductivity–temperature–depth (CTD) device on a trainwheel. understanding of the climate of Earth, the erosion of coastlines, and how the world's oceans both provide and store vital nutrients and compounds such as carbon dioxide. Instrumentation is vital to the study of physical oceanography. Determining wave height, water temperature, or current flow is impossible without a means of measurement. For example, the height of the waves pounding onto the shore can be measured using conventional measuring instruments. Away from the shore, the wave height in deep water is measured using an instrument called a tide gage. The gage is immersed in the water and measures the weight of the water on top. A higher weight, for example, means more water and a higher wave that—depending on other physical factors—might eventually produce a higher wave at the shore. Temperature determination interments vary depending on the location and the length of time the measurement is being recorded. Dangling a thermometer from a boat manually accomplishes a one-time surface measurement. Measurement of deeper-water temperature or the temperature over time, however, often utilizes a thermometer attached to a deep-water device or buoy, makes indirect measurements based on the speed of sound in water. Buoys, for example, are used in the Pacific Ocean to chart the water temperature fluctuations associated with the El Niño phenomenon. Physical oceanographers routinely use satellites to gain measurements over large distances and areas. Instruments on satellites can measure ocean height and thereby allow estimations of ocean surface temperature. Spectral studies can detect the presence of surface organic material such as algae. Other instruments can allow estimates of wave height and wind speed. Measurements in physical oceanography occur over a large range of scales. For instance, measurements of ocean current can vary from a few centimeters to the entire globe, and measurements of current variability show movement occurring over a few seconds to estimates spanning thousands of years. Funding for physical oceanographic research typically comes from governments: directly, through agencies like the National Oceanic and Atmospheric Association (NOAA), or indirectly, through funding of university or other institutional research. Many universities have departments where physical oceanography research is carried out (e.g., San Diego's Scripps Institution of Oceanography, which is affiliated with the University of California). Additionally, entire institutions devoted to oceanographic research exist around the world (e.g., Woods Hole Oceanographic Institution in Woods Hole, Massachusetts). Funding also comes from private sources, such as oil companies. SEE ALSO Moorings and Platforms ; Ocean Currents ; Ocean Mixing ; Oceanography from Space . Pickard, George L. and William J. Emery. Descriptive Physical Oceanography: An Introduction, 5th ed. New York: Pergamon Press, 1990. Ross, David A. Introduction to Oceanography. New York: HarperCollins College Publishers, 1995. The launching in 1978 of Seasat, the first oceanographic satellite, revolutionized measurements of physical properties of the ocean. Within a few years, sea-surface temperature, wave height, variations in sea surface contours, ice cover, chlorophyll content, and other parameters could be measured and reported almost instantly from satellites.